Most ISPs are in the process of enabling the IPv6 protocol which is then available for usage in addition to the currently used IPv4 protocol. 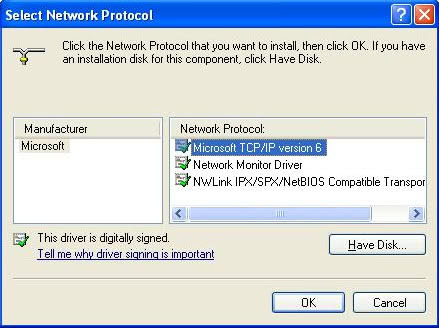 Windows Vista and Windows 7 users do not need to enable or configure their operating system for IPv6 usage as it is enabled by default. The situation is different for Windows XP users who need to install the IPv6 protocol to add support for it to the operating system. It is probably a good idea to test if IPv6 is already available on the operating system. An easy option to find out is the ipconfig command which displays network information in a command line window. To run the command press Windows-R, type cmd and hit enter. This opens the Windows command prompt. Now use the command ipconfig to find out if IPv6 is available on the computer. 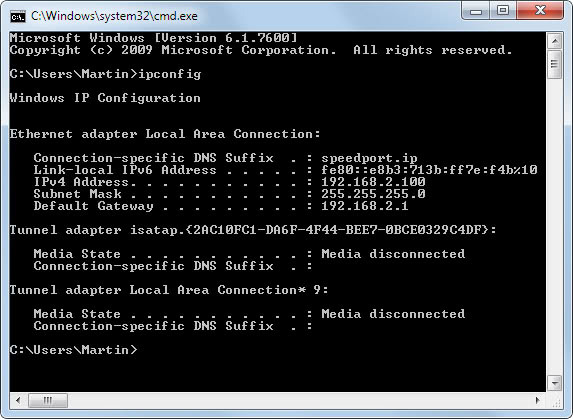 Please note that the following screenshot is showing ipconfig on Windows 7. This installs IPv6 under Windows XP. It is also possible to install the protocol under the network settings options of the Control Panel. Right-click on the appropriate network adapter and select Preferences from the selection. Now select Install on the screen and then Protocol from the available options. Locate Microsoft TCP/IP Version 6, a click on OK installs the selected protocol. You can check again with the ipconfig command to make sure that the IPv6 protocol was installed successfully on the operating system. Thanks, Martin, aany side effects, issues to install IPv6 protocol before it be required ? I know nothing about this. I’m not aware of any. It is just another protocol. That link yields a 404 error, Rinaldi. I think that’s a bit of a stretch, Martin. For the majority, especially in the US and Europe, some form of Carrier Grade NAT, is the mostly likely path, at least in the foreseeable future. The picture is somewhat different in ASIA. Unfortunately, most implementations of CGN will have an impact on performance, and if you want a routable IPv4 address, it’s going to cost. Stefano you do not need to do that. As I said, it is already enabled on Vista and 7. I think it’s worth pointing out that unless your router and firewall support IPv6, you have little in the way control over some aspects of the IPv6 stack. Dougle great addition, thanks for posting. well i have ipv6 installed only problem is my ISP doen’nt support it yet….i wonder when will they able to support it. Henk Poley, thanks for info how to solve Extended error (Błąd rozszerzeony). Your solution worked! OK so my main PC has Windows 7 Ultimate, and IPv6 works just fine, but my other PC with Windows XP Professional, and the same model of Wireless LAN card, coincidentally…will still not pass any of the online IPv6 tests after using the information provided in this article. I’ve tried rebooting & uninstalls/reinstalls of IPv6 in the prompt, but it doesn’t seem to make a difference. I have a remote linux machine, for which i want to ping. My windows machine has bot ipv4 and ipv6 address. I can ping successfully to the remote linux machine only on the ipv4 address, but i “can-not” ping to the ipv6 address of the remote machine. Appreciate if you can mail.